Crispy and chewy. 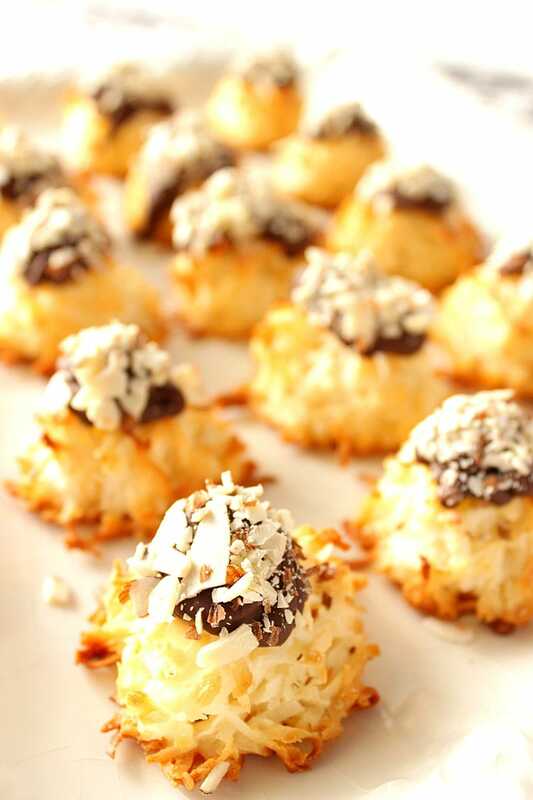 These Chocolaty Almond Joy Coconut Macaroons are a cross between a piece of Almond Joy candy and a cookie. What’s not to love? Do you have a favorite candy? Me, I’m not normally a candy eater, but when faced with an Almond Joy candy bar I’m hard pressed to resist. 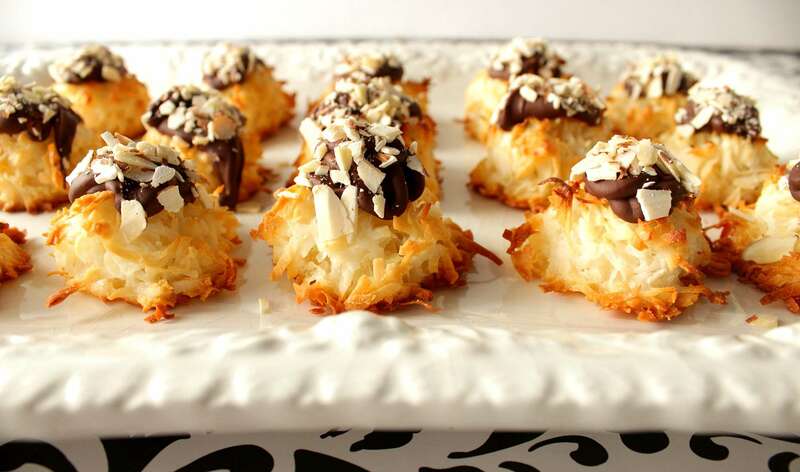 These chocolaty coconut macaroon cookies remind me so much of the iconic candy bar, only better. After all, look at all that toasted coconut!! In a large bowl mix together sweetened flaked coconut, a can of sweetened condensed milk, and almond extract. …until stiff peaks form. Gently fold the beaten egg whites into the coconut mixture until thoroughly combined. Drop the coconut macaroon cookie dough by rounded tablespoons onto a parchment lined baking sheet. Bake the macaroons in a preheated oven until browned. Meanwhile, melt semi-sweet chocolate chips in the microwave. Stir in espresso powder. When the macaroons are cooled, dollop approximately 1 teaspoon of melted chocolate on top of each cookie and sprinkle the melted chocolate with chopped almond slices. Crispy and chewy. 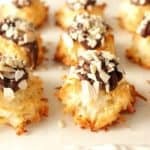 These Chocolaty Almond Joy Coconut Macaroons are a cross between a piece of Almond Joy candy and a cookie. Mix together the coconut and sweetened condensed milk in a large bowl until combined. Set aside. In another large bowl, use the hand mixer to whip the egg whites on high until stiff peaks form. Add the whipped egg whites into the coconut mixture and use a rubber spatula to gently fold the egg whites into the coconut mixture until thoroughly combined. Use two tablespoons or a small melon baller to drop the macaroon dough on to parchment lined baking sheets, spacing about 1" apart. 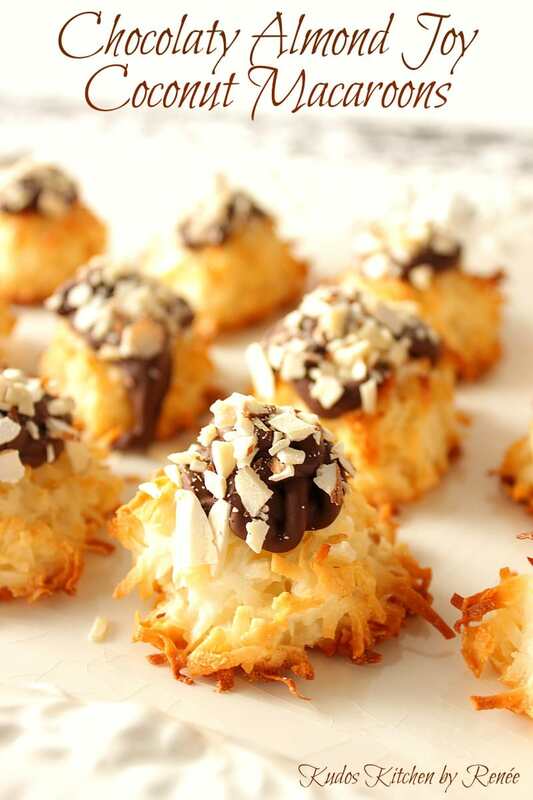 Bake the macaroons in a preheated oven for approximately 25 minutes, or until the cookies are golden brown. Remove the baking sheets to a cooling rack and cool completely. Meanwhile melt the chocolate chips on medium power in a microwave until melted. *NOTE - it is best to do this in 30 seconds intervals, stirring after each interval, until the chocolate is melted. Trying to heat the chocolate up too fast will harden the chocolate instead of turning it into a creamy consistency. Stir in the espresso powder to the melted chocolate. Once the cookies are cooled, dollop approximately 1 teaspoon of melted chocolate on top of each cookie and sprinkle liberally with the chopped almonds. Don't be impatient when it comes to melting chocolate in the microwave. Low and slow is always best! The espresso powder in the recipe is optional, but it will give the chocolate a richer, deeper level of flavor. 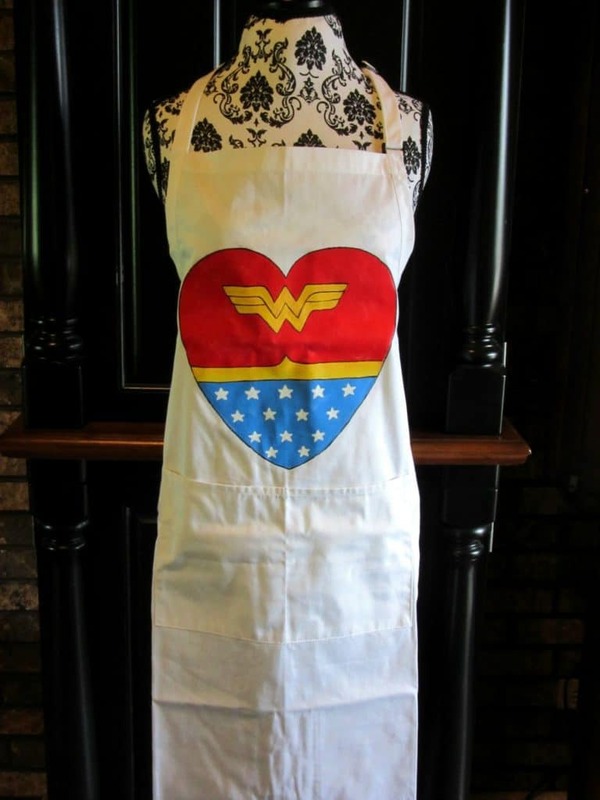 The aprons I paint on are completely machine washable and dryable (no fabric softener please). They have adjustable neck straps, extra long ties, two large front pockets and are a 65/35 poly cotton blend. My glassware items are completely dishwasher safe as well as being non-toxic. Each glass I paint comes in its own gift box. Personalization, if requested, is always free of charge. I love custom special orders. I will happily paint and design from any photo, description or idea you send my way. Please contact me for a price quote, or visit one of my shops: Etsy, Wazala, or Kudos Kitchen Paints. Macaroons have been one of my favorite cookies since I was kid. These look perfect! 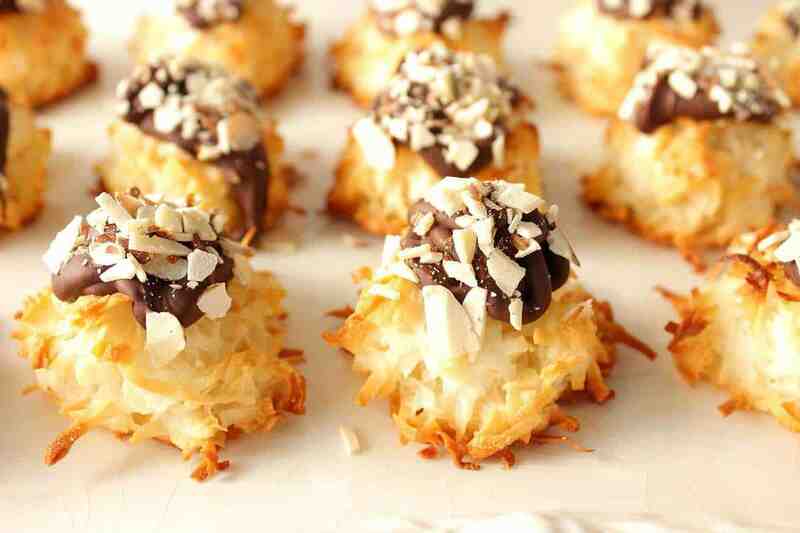 I looooove coconut macaroons! 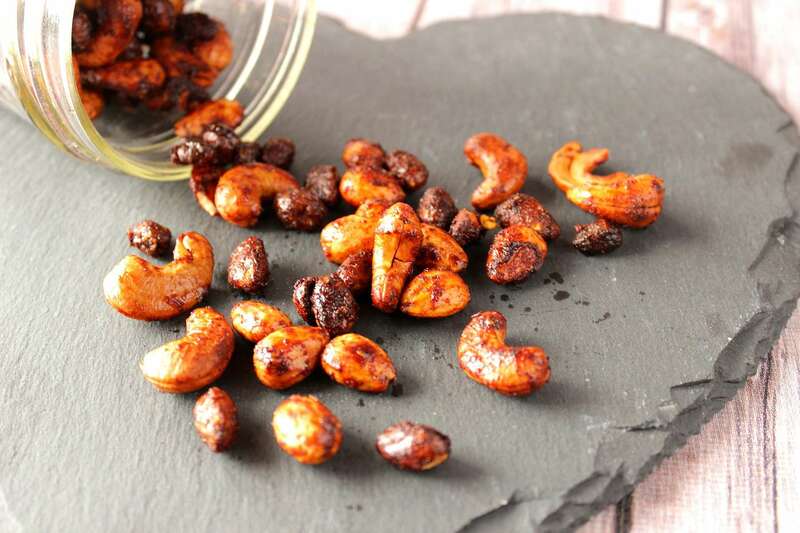 It’s been ages since I’ve made them though and that needs to change – thanks for reminding me and for this great recipe! they sound absolutely perfect. Pinning! I’d have to say almond joys are right up there with my favorite candy – along with butterfingers, of course 🙂 Love these macaroons! I adore coconut. While I’m at it, I adore everything about this recipe. 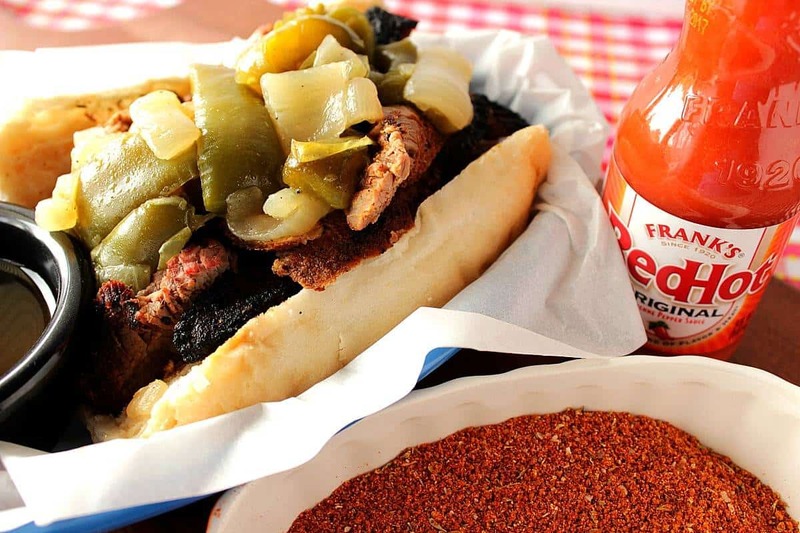 Such a delicious bite! Almond Joy just happens to be one of my faves, so I’m in all the way w/ this one. Yes please! These are great for all coconut lovers out there! Love cookies that freeze well! 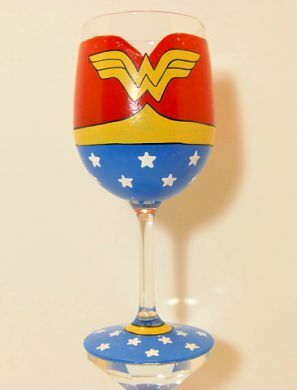 And that apron and wine glass are amazing! Nice job! I love me a good almond joy! If I made these I would probably drone mine in chocolate – that’s acceptable, right?! 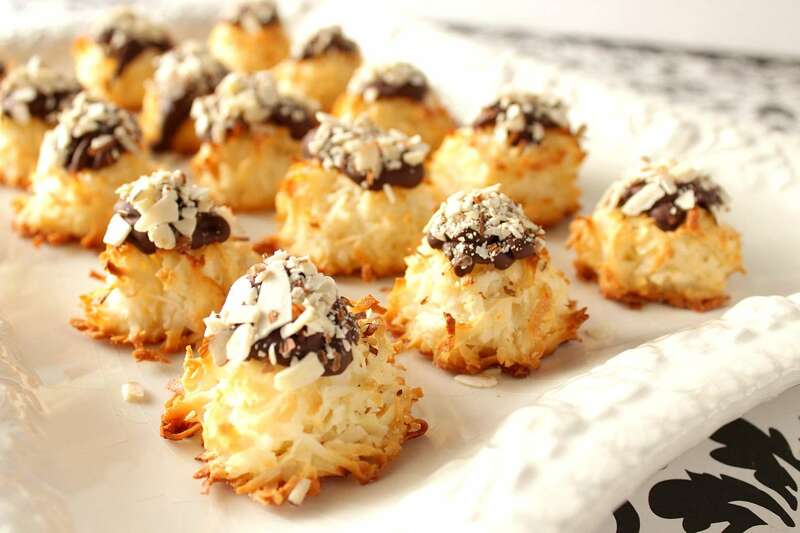 I love coconut macaroons and haven’t made them in so long. I know I wouldn’t be able to resist these, especially with the candy topping! They are so cute and dainty! Perfect for serving at brunch or book club. I can’t wait to try them out! When I have cookies in the kitchen I cannot stay away from them! These cookies would be extra dangerous. I love anything with coconut but it gets even better when you throw in chocolate and almonds. my dad loves Almond Joys! This birthday is coming up soon and I think ‘m going to make a whole batch of these and package them up for him! I know that my dad would have loved these too. I think I get my love of coconut from my dad! I hope he loves them, Angie. Sharing these for my holiday cookie ideas! So good! Thank you so much, Kellie! I appreciate that! !